In another remarkable display, World of Outlaws champion Donny Schatz has again decimated his opposition to score an emphatic win in round nine of the East Coast Logistics Sprintcar Track Championship at Ausdeck Patios Archerfield Speedway on Tuesday night (January 1). Starting from the outside front row, Schatz led every circulation of the 35-lap feature event, clocked a fastest lap almost a full second quicker than anybody else and lapped all but the top five in winning by more than eight seconds ahead of fellow WoO star Logan Schuchart. Bouncing back from a crash in his opening heat race, Mitchell Gee finished in third spot ahead of Peter Lack and Allan Woods. Dirt Modifieds made every effort to upstage their V8 brethren with a thrilling Paul Britten 44 Memorial Feature Race that saw Jai Stephenson storm from 18th to score a remarkable win. Having led throughout until rounded up by Stephenson with just four laps to run, Scott Cannon finished in second spot ahead of Mitchell Randall, Anthony Ashen and Andrew Pezzutti. In Formula 500 action, Nathan Pronger proved too quick in the feature race to lead home Kristin Brown and Jarrod Bampfield, with Cameron Bertuch and Ryan Skennar rounding out the top five. A stout field of Sprintcar drivers fronted to kick off the New Year, with 37 cars racing the clock in time trials and, in a sign of what was to come, it was Schatz who emerged as the only driver to go under 12 seconds, securing KRE Quick Time with an 11.887. Luke Oldfield (12.022) was second best, followed by Gee (12.103), Andrew Scheuerle (12.122), Lack (12.143) and Brett Minett (12.190), with Woods, David Whell, Kevin Titman and Andrew Corbet the best of the rest. Having qualified outside the top twelve, Schuchart started his climb back up the order with a win in the opening heat, downing Ben Hilder and Darren Jensen, with Schatz advancing from eighth to fourth. Clem Hoffmans was too quick from the front row in heat two, leading Brent Kratzmann and Ryan McNamara to the flag. Gee suffered a significant setback in heat three when a spin from Bryan Zelinski in turn two on lap two left the Queensland champion upside down. Scheuerle was also caught in the crossfire and forced to the infield while Zelinski emerged unscathed and was able to take his place at the rear for the restart, from which Kevin Titman emerged as the race winner ahead of Anthony Lambert and Andrew Corbet. Jensen looked to heat have four in his keeping until he was bumped out of the lead by Woods through turn one on the final lap, the aftermath of which saw Schatz slip into second and left Jensen just one point short of direct qualification into the feature. Dan Murray led home Oldfield, Lambert and a repaired Gee in heat five, with Scheuerle also bouncing back from his earlier setback to take the final heat in advance of Hilder and Zelinski. The C Main saw Adam Butler survive a late-race surge from Paul Rooks, with both drivers securing a berth in the B Main, which was subsequently taken out by Jensen ahead of Lambert, Mark Pholi and McNamara to finalise the back two rows of the feature race grid. The Spanloc Dash saw Schuchart take advantage of his pole position start to lead home Schatz, who topped qualifying but selected position four in the pre-race grid draw. Oldfield was the best of the rest in third spot, followed by Titman, Gee, Woods, Scheuerle and Lack. Like those in the same position at the two previous events, Schuchart declined the offer to take the BK Trading Challenge to invert the feature race field, thereby handing Schatz a front row start and the subsequent shellacking he inflicted upon the field. Schuchart got the initial jump at the commencement of the feature race, only to have Schatz emerge from turn four with the lead before a skirmish in turn one resulted in Dean making an early exit as the race resumed with Schatz surging into the lead immediately. The next stoppage came as soon as lap two when Corbet somehow spun in the main straight and triggered a pile-up that put Murray, Minette and Lambert on the infield. As Schatz cleared away out front, the racing further back was providing action aplenty as Schuchart and Oldfield swapped spots in a series of slide-jobs and counter attacks until the inexplicable happened when Oldfield looped the Shock Shack #17 in turn four on lap 15, a mistake that saw him slip back to seventh, the position he would hold until the end. With Oldfield no longer hassling him, Schuchart enjoyed a clear run home to snare second place as Gee surged into third to outpoint Lack and Woods, who were the the only others to finish on the lead lap. Jensen was next beast ahead of Oldfield, Mark Pholi, Titman and Ben Hilder. Dirt Modified heat race wins were shared between Stephenson, Cannon, Randall, Kev Stow, Geoff Phillips and Ray Klarich, while Mark Robinson had the unfamiliar task of leading home the B Main field to secure his place in the feature race field. Phil Roberts, Chris Corbett and Zac McDonald also made the grade to secure the remaining feature race spots up for grabs. The Pole Shootout is somewhat different for this event as, upon completion of the 6-lap sprint, each of the drivers is offered the opportunity to start from the rear of the field for the 44-lap feature face, with an additional $1500 on offer for anybody who can win the race from the back. Setting the ultimate example in the race staged in memory of his father, Kevin Britten had already declared he would start last and, of the six participants in the Shootout, Ray Klarich, Stephenson, David Clark and Geoff Phillips accepted the challenge, leaving Cannon and Anthony Ashen to share the front row for the main event. With Cannon jumping into the lead from the start, all interest lay in the battles back in the pack with the likes of Stephenson, Britten and Clark making some progress. Stephenson, however, was on a charge and steadily worked his way into fifth by lap 23 and into third with 10 laps to run, before relegating Cannon with four laps remaining to score a win that earned him admiration aplenty from the fans. Randall finished strongly to secure third from Ashen and Pezzutti, who looked on track for a top-three result in the early stages. Klarich, Phillips, Zac McDonald and Andrew Firth rounded out the top ten as Britten unfortunately headed infield on lap 36 just as he seemed set to pounce on the first five. Bampfield, Skennar and Pronger shared the spoils in the Formula 500 heats before the latter bested the field in the feature race. Brown chased Pronger through the feature and the initial margin between the two remained static to the end, while Bampfield had to work hard to regain third spot in the closing stages. Cameron Bertuch finished fourth ahead of Skennar, who started from the outside of row four as a result of his disqualification from heat three following a clash with Tarhlea Apelt that sent her upside down and out of action for the rest of the night. Behind Skennar came Ron Barber, Tom Qualischefski, Brady Argles, Thomas Partington and Royce Harvey. Following heat wins to Dave Tookey, Michael Laver and Daniel Wright, it was Tookey who prevailed in the Ford vs Holden vs Sigma feature race, leading home Laver, Troy Price and Mickey Mitchell. 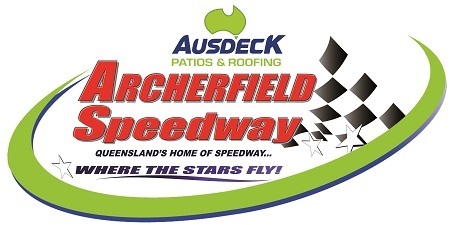 The next event at Ausdeck Patios Archerfield Speedway is the WSS Titan Garages Australian Open this Friday and Saturday night (January 4 and 5).